How do you train for a 70 mile race followed by a marathon followed by a 50 miler? It’s actually only 14 weeks away now until Mablethorpe, which has come round really, really quickly! I set out the weeks in the table above and filled in the races I’m at first, then slotted in my social calendar outside of running as I know there are some days that I physically and logistically would not be able to get a run in. Each week has at least one rest day, with eleven days off of rest back to back for when I go on honeymoon in August! I’ve also ensured I get a quicker session in each week with either a speedwork session at club or a tempo run, with a few parkruns thrown in for good measure. As I’m quite close to the Grim now, (less than five weeks away), my miles are not particularly high as I don’t want to get injured or burn out before the day, but I do have a few longer runs planned back to back so that I can practice running on tired legs. I spoke to a club runner at the weekend who ran the Grim 70m last year and he told me that he had actually ran no further than 20 miles before the race and taken a couple of weeks off completely when on holiday in the build up to the race. My weekly mileage has been around the 50m+ mark since coming back from injury in January, and since London marathon in April I’ve run 10+ runs over 20 miles with my top distance run just under 44 miles. I’m coming from what I consider to be a good fitness base, and mentally I’m stubborn and strong. With no serious time goal to stick to I hope I’m coming from a strong position in order to finish the race. September is currently looking very busy for races with four of them within two weeks of each other. Great North Run is a definite, as I had to defer my place last year and I have been given a place in the Gladiator Games 10k in return for blogging about it so that race is also a certainty. I would like to run the Royston half (a trail half marathon) as I have heard only good things about it, it’s part of our club trail series and only £6 to enter. Can’t go wrong with £6! The Dunstable Downs Challenge is another trail race that’s part of the club trail challenge series, but at a marathon distance. If I were to enter the DD Challenge, I would run it very, very easy, but I’m pretty sure I won’t be entering as I don’t want to overdo it before Mablethorpe. My goal races are the Grim Reaper where I aim to just finish the event and Mablethorpe marathon where I would like to duck under the 5 hour mark pretty please?! After Mablethorpe I’ll taper back down before Dusk ’til Dawn at the end of October and then have a few months of easy running – no plan, no races booked in. Just what I fancy, when I fancy it and enjoy a bit of married life hopefully! 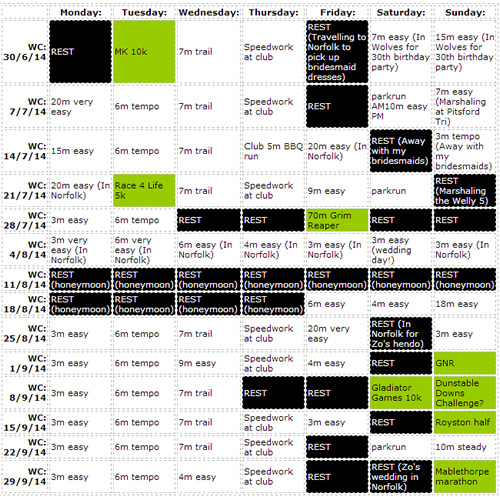 How do you work out your training plan for races/keeping fit? Wow. Even I think that’s an intense plan, and I’m not exactly known for moderation when it comes to running (hence the horrible injuries)! Would it be okay if I messaged you on FB about the Grim Reaper? Basically I’m desperate to be able to run it (or walk it…) but I’m not quite sure how on Earth I’ll be able to manage. I wondered if I could ask your advice? Thanks! Yes of course you can. Don’t know how qualified I am to give you advice though!!! Thanks for sharing I’d love to complete an ultra at some point in the future so I found this really interesting as I was curious how much training goes into running ultras, and just how long the long runs are. Seeing your plan makes me hopeful I can tick off “run an ultra” from my bucket list in the future. Hope all goes smoothly with your training and you ace your goal races! No worries. Fingers crossed you can find an ultra you’d like to try soon. If you want a recommendation, I loved the Shires and Spires ultra as my first one. 35 miles is a nice distance just over the marathon to get started with. Jesus that is a lot of miles! I wish I could be at the mileage right now, but I think I’m proper burnt out post 2 marathons/ultra earlier in the year, and struggling with constant injuries. I really need a long rest from running but I’ve got Berlin in Sept so can’t afford to Looking forward to following your training. I was worried about burn out but luckily (touch wood) it hasn’t hit yet. I’m hoping the time I take off when I’m away on honeymoon will leave me ready to come back and smash my marathon time in October. Fingers crossed for no more injuries for you. Wow that is a lot of miles! I sometimes follow a training plan, but recently I have just been going out as and when, and adding to my long run each week, but then I have not been chasing a pb or anything. As long as you’re happy with the mileage I don’t think following a training plan is vital. Sounds like you’re still going strong if you are able to add to your long run each week. Jeeeeeeeeeeeeesus. You are amazing. Can we trade bodies please? I want your strength and endurance! I’m running poxy 25-30 mile weeks and desperately dodging niggles here there and everywhere and you’re bashing out ultra runs and marathons like there’s no tomorrow. I’m not sure you’ll be able to stop on your honeymoon hehe 😉 In all seriousness, it does sound like a good plan. Also, £6 for a race entry? And a half as well – nice! I know – £6 is amazing value for money. Why aren’t all races this price?! Oh good. I’m glad I’m not the only one making it up as they go along … although this does look remarkably organised!! I’ve got TR24 as a solo in a few weeks and hoping desperately that my pitiful miles as Endure 24 and recent marathon length runs will make up for my lack of training!! Plus going on holiday the week before counts as tapering right? And alcohol as carb loading?? Alcohol and chips are definitely great carb loading sources and a holiday is the perfect taper before an event! Sounds like you have it sussed! 😛 Good luck for TR. I’m not sure I could ever do a 24 hour event. I’m certain I’d end up falling asleep as I’m running around! wow the schedule will help you track progress and your abilities.